Fitzroy Falls is located in the Morton National Park, just North of Kangaroo Valley. This is an excellent bushwalk to take your children on. The tracks are well maintained and an easy walk. Through there are a few sections that would be rated medium. There are 2 walks to go on. The West Rim walk and the East Rim walk. 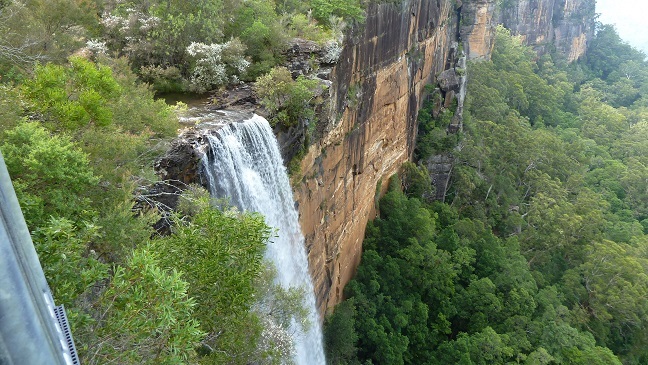 The West Rim Track is the most popular and offers the best views of Fitzroy Falls. The trail is a 4km return hike. Though to get to the top of the waterfall is only a very short distance from the visitors center. There are about 4 different lookouts along this trail offer excellent views of the valley and different angles of Fitzroy Falls. There are also a few different waterfalls to see on the way. The East Rim track is about 7km return. It offers an excellent bushwalk experience going through rain forest type conditions. For the first 1km there are a variety of ferns along the way. There are also a number of lookouts along the East Rim bushwalk. The first or second lookout, about 1km offer another view of Fitzroy Falls. Most people avoid the East Rim track. However I recommend just doing a kilometer to the first lookout of Fitzroy Falls. The walk is excellent and this view is well worth a look. If your feeling up to it doing the whole East Rim is also worthwhile. There are a number of lookouts over looking the valley. Surprisingly the visitors center had good coffee and the food look alright. I don’t have high expectations getting coffee from these sort of places but this beat my expectations. Enjoy the day. Check out some of the pictures below. Google Maps Link. Drive to the Fitzroy Falls Visitors centre. It’s off Nowra Road. Youtube clip of Fitzroy Falls. The clip below is of the Fitzroy Falls bushwalk and lookout. Fitzroy Falls, Fitzroy Falls bushwalk, bush walk, hike, trek, waterfall, southern highlands bushwalks, Morton National Park, southern highlands waterfalls.